We just returned from a little get a way to Disneyland. Disneyland is wonderful, and this is my first time seeing it around Christmas time. We are still over a month away from Christmas, but they already have the place pretty decked out! I hear that on Christmas they actually make it snow there! Someday I'm going to have to see that. Of course being a lover of food I enjoyed all the things we ate there. They have some amazing corn dogs. I have a new found desire to figure out hot to make their corn dogs. They really were delicious (in the most unhealthy kind of way). Hopefully someday I can share the recipe with all of you! Before we left for Disney land a friend and I got together and made canned apple pie filling. I absolutely love this stuff. We made the same stuff last year, and I used it all year round. I recently ran out and was so very sad. It is so nice to have it whenever I want to make an apple pie, or an apple crisp/cobbler. Really 99% of the time I make apple crisp. Oh how I love apple crisp! This recipe really isn't hard at all and you can have your own homemade pie filling to use whenever. I prefer to make a big batch, this way I have lots to last me a while. In a large pan, mix sugar, cornstarch, cinnamon and nutmeg. Add salt and water and mix well. Bring to a boil and cook until thick and bubbly. Remove from heat and add lemon juice and food coloring. Sterilize canning jars, lids and rings by boiling them in a large pot of water. I cheated and just put them in the dishwasher. This worked well enough for me. Peel, core, and slice apples. 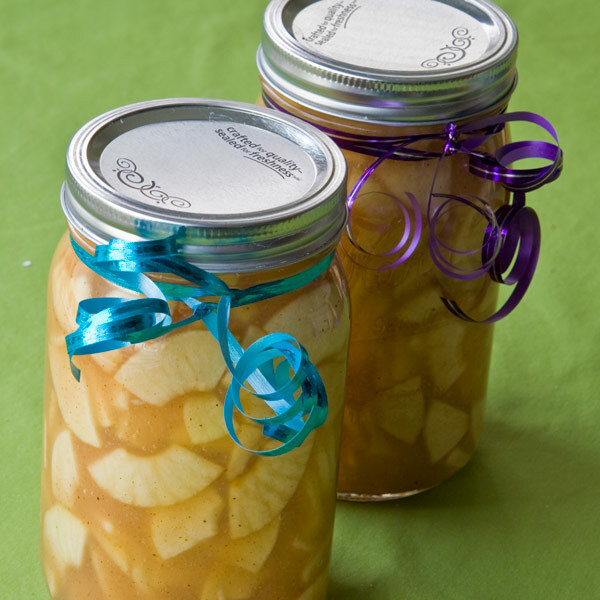 Pack the sliced apples into hot canning jars, leaving a 1/2 inch head space. Fill jars with hot syrup, and gently remove air bubbles with a knife. Put lids on and process in a water bath canner for 20 minutes. This is such a great idea! I would love to do this for gifts! Wow how creative! This looks delicious! BRILLIANT!!!!!!!! I need this! to make for moi and to gift! <3 Thanks girl! My daughter is the Apple Crisp Queen and she would flip if I had a stash of this on hand. I'll have to surprise her with it.